Darned right Joe, Dr. Michael Savage speaks about this – the biggest “prize” would be passing a mass amnesty, which would fundamentally destroy whats left of this republic. The administration and the media don’t want people to focus on this fact, so they create diversions… All these big problems, are designed to pull down our society, so it can’t recover. But to a progressive commie; the end justifies the means! Personally speaking, 2 Thes 2 is well underway; and I won’t loose focus on that. Thanks for the article, keep up the good work! Mixing up a love for the world, and a love for God! 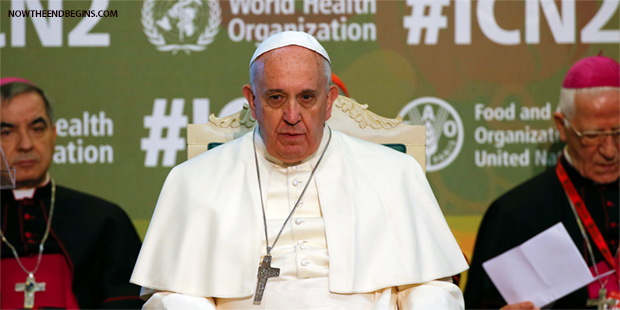 “God always forgives, but the earth does not,” the Argentine pope told the Second International Conference on Nutrition (CIN2) in Rome, a three-day meeting aimed at tackling malnutrition, a global scourge which afflicts poor and rich alike. In a very strange message, Pope Francis warned that the Earth “would not forgive us” and would “respond with destruction” to man’s greed. Looks like Francis has become a New Age Universalist, steeped in Babylonian eccumentalism, pluralism, and multiculturalism, “in mixing it all together” (like the feet of Iron and clay, found in Daniel) – which will be destroyed; when the Lord returns for judgment…. Will he be the man who announces (reveals) the “man of sin” to the world, the great whore church, and her daughters? PROBABLY SO, and even according to Roman Catholicism’s legend, this Pope is said to be the last Pope on earth! I think it is interesting that this Pope charges humanity with; the earth not forgiving : this appears to me like “Satan will soon be revealed”, and worshiped as God. That wicked, the son of perdition playing God – who shows many signs and lying wonder: looks to be transpiring – even as we speak! 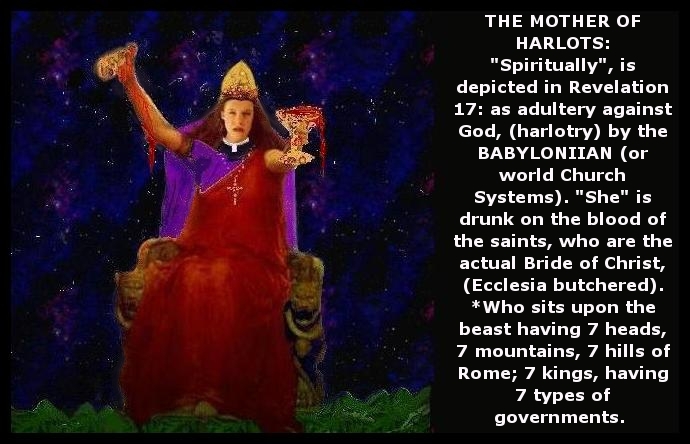 “Who sits upon the beast (church systems): having 7 heads, 7 mountains, 7 hills of ROME; 7 kings, having 7 types of governments..? Luke 8:4-15 Many different doctrines have been written concerning these passages of scripture, but what is the truth – that you might be saved? Explaining away the revelations of God is Satan’s favorite pastime. It is intellectual and carnal, and is independent of the Holy Spirit, which is sin; and done by enemies of the cross! This is why Jesus said it has been given unto you (spiritually) to understand, whereas others will not… And this “is engineered” purposely by God, in protecting his flock! The “others” are those which do not have enlightenment spiritually to this passage; as either they have never seen Him or known him; or the particular heart of the one who would “add or take away from this text” has a heart which is anything but good ground, and is labeled as an anti-Christ by the Apostle John, who coined the phrase! My point is that, many, many men in carnality use the scriptures to “bring men into themselves”, but they will not yield to the Holy Spirit of truth, who is Jesus Christ himself; as they have not a love for the truth, that they might be saved! The “Church system” of today is infected by such men, who build institutions to teach their particular brand of heresies. Jesus Christ never intended this for HIS people, and the apostles “corrective” letters to the early brethren reflect this trend of moving independently of the Holy Spirit; who is Jesus Christ, the only truth of God, who is the ONLY mediator (spiritually) which a disciple must abide in, or be cut off and burnt! This pure truth of God, if you will, has been lost in many a sea of error, and natural understanding. Yet it can still be tapped into by those who love the Lord, who IS the only truth of God that the lost sheep, might be found! Carnal denominationalism, attempts to explain away naturally – what I have written in the spirit – to make the truth of God, (only found by abiding in Christ, Jesus) more palatable to those, which would take the broad road; (which leads to spiritual death). And to the nominal, or “self righteous religious – Christian” who was never even elect of God to begin with! These two types of brethren, enjoy each other’s company, and “fellowship together” as they are both moving independently from the Lord in carnality; as they are both either spiritually dead, or dying! The Bible is written to the actual Ecclesia, or elect of God – in particularly, the one who manifests that they are good ground, which Jesus spoke of; and NOT the others types of ground, who will embrace the “spirit” of error, which will deceive many! Satan knows this principle full well, and continues to mobilize, and when he can, deploy his troops in amongst the sheep, to deceive and destroy their spiritual walk! Most commonly using the natural mind or (intellect) in understanding the scriptures, independent of God. They then often go and build institutions or temples to the Lord, just like Peter recommended to Jesus; prior to the day of Pentecost! 9 And when his disciples asked him what this parable meant, 10 he said, “To you it has been given to know the secrets of the kingdom of God, but for others, they are in parables, so that ‘seeing they may not see, and hearing they may not understand.’ *(the Gospel is not intended for everyone) 11 Now the parable is this: The seed is the word of God. *(Which is not the Bible; but rather the Holy Spirit) 12 The ones along the path are those who have heard; then the devil comes and takes away the word from their hearts, so that they may not believe and be saved. 13 And the ones on the rock are those who, when they hear the word, receive it with joy. But these have no root; they believe for a while, and in time of testing fall away. 14 And as for what fell among the thorns, they are those who hear, but as they go on their way they are choked by the cares and riches and pleasures of life, and their fruit does not mature. * (Babes in Christ) 15 As for that in the good soil, they are those who, hearing the word, hold it fast in an honest and good heart, and bear fruit with patience. *(The Narrow Way, which leads to life). Attempts to explain this away from different viewpoints, independent of the Holy Spirit is described in, (unsound doctrine) *2 Timothy 4:3 – but rather is heresy, and of the spirit of error, which is anti-Christ, and no matter how exacting, (naturally) and to the letter it might be taught, if independent of the Holy Spirit – the Spirit of Truth. Jesus is describing precisely what he intends to teach, which does not allow for interpretations, as found in Armenian, Calvinist, Universalists, or any other man orchestrated doctrines. The truth of God, only found by abiding in Christ, is the spirit and in truth; that we might be saved. If you are moving independently of the Holy Spirit, you are in fact moving away from Christ, who is your only salvation unto spiritual life, (now) and into eternity! The real issue, and the thing most will not address. How on earth are church people disciples? Marriage is our most important and timeless social institution. Marriage is a personal promise between a husband and wife that accomplishes a unique and special public purpose — providing children with a secure social and legal attachment to both their mother and father (while also binding together the mother and father themselves). Redefining marriage fundamentally undermines this public purpose by saying (legally, socially, and culturally) that both men and women — moms and dads — are not essential to children, the family, or our future. Confusion brings darkness, and it is the enemy’s vested interest to bring it about.